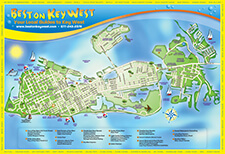 Join Best on Key West for a day of family fun and excitement aboard our 60-foot catamaran. The adventure begins with a 10 a.m. departure to set sail for Florida’s beautiful coral reef. On the way you can enjoy our delectable continental breakfast that features homemade pastries and eggs as well as assorted juices. After breakfast, our expert crew members will instruct you on the use of the snorkeling equipment as well as demonstrate the proper techniques for snorkeling. All of our equipment is fully sanitized for your health and safety, and we encourage our passengers to ask questions or voice concerns at this time for the benefit of all of our snorkelers. Upon arrival at the reef, you’ll have a full hour of snorkeling free time to explore the majestic and mysterious coral reef. This complex ecosystem is home to millions of fish and marine plants that thrive in the crystal blue waters surrounding the Florida Keys. The reefs are a must-see for snorkelers of all ages and abilities as it is truly a sight you’ll never forget. Once snorkeling has concluded, we’ll sail for the beautiful backcountry for an exclusive afternoon of dining and watersport activities. During this time you can refuel thanks to our catering company -- the favorite of all the locals -- and the extensive buffet they provide. Lunch includes peel-and-eat shrimp, fried chicken, assorted Boar’s Head meat and cheeses, assorted breads and condiments, assorted side salads, fresh fruit and the tastiest chocolate chip cookies. While anchored in the backcountry, we provide a watersport bonanza that will wear you out. Watersports include jet skiing, parasailing, paddle boarding, kayaking, water trampolines, giant waterslides and banana boat rides. This is a great family activity for children and adults of all ages that lasts approximately 2 ½ hours. For the adults on our tour who may want to end their watersport activities early (and who have a valid photo I.D. ), we provide complimentary beer and wine which is also available on the return sail. We invite our passengers to relax in the afternoon sun during the peaceful trip back to Key West, and our tour concludes at 4 p.m.
Our Power Adventure passengers should expect 6 hours of fun and adventure. Passengers born in 1988 or later must complete a Florida Safe Boaters Test to drive our jet skis and all passengers who wish to drive a jet ski must present a valid photo I.D. The test fee is $3 and can be completed, and paid for, during the 9:15 a.m. check-in. Children must be at least 6 years of age to parasail, and the parasailing activity is subject to a 450-pound max weight limit.